We opted for a walk around Edale today rather than climbing due to Alice having to be away for the day. We set out from Edale car park, heading for the main village and the cloud had already started to break up. Crossing the beck and heading for Grindslow Clough. This amount of sunshine and blue sky was not forecast but very welcome. Following the path towards Kinder Scout. A view across the valley to Grindslow Knoll. We will be up there soon enough! The sharp ridge that is Ringing Roger. Zooming in on Ringing Roger. Following Grinds Brook with amazing views today. One of the many small waterfalls along Grinds Brook. Thats our route up. Looks a bit steep! Zooming in on the path where you can make out other walkers. One of the other side valleys. Not that way today. And as if by magic we were up on the plateau. From here we headed over to the right to Grindslow Knoll. Interesting rocks along the path. A view down to where we were earlier. 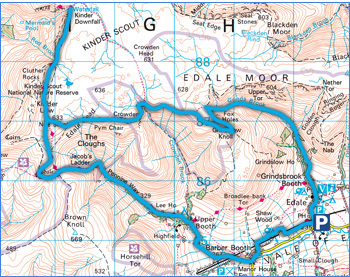 Grindsbrook Clough and our route of ascent. The summit cairn on Grindslow Knoll. The route ahead along the edge of the plateau round to Crowden Tower and Pym Chair which you can just make out. A view back to Grindslow Knoll. Lovely views today over the moorlands. This is the view from Crowden Tower to Grindslow Knoll. More odd shaped rocks along the path. Rocks marking the summit of Crowden Tower. Views over to Swine's Back and Brown Knoll. And again but this time from the air! The summit trig on Kinder Low. From the trig we headed north to see Kinder Downfall and the views changed so we could see Kinder Reservoir. Approaching Kinder Downfall. Due to the lack of rain recently I'm not sure how much water will be flowing. Not much water today at Kinder Downfall. Kinder Downfall. From here we headed back to the south to Kinder Low. Another picture of the Trig Col this time in the sunshine. It was near Edale Cross that we joined the Pennine Way. Descending down to the valley floor. And a final view of Lose Hill ridge before getting back to the car.